Most women seeking divorce have 3 priorities: 1. Divorce Certificate 2. Custody of the children 3. Maximum Financial support and settlement. The methods of dissolution of marriage for muslims and non muslims residing in the UAE. Dr. Hassan Elhais explains whether financial orders outside the UAE are valid and how they are enforced and what legal challenges can be faced by the parties. Dr. Hassan Elhais comments on what factors the local courts take into consideration while deciding the financial obligations of a parent after divorce. Dr. Hassan Elhais clarifies the methods of divorce under Shariah. Dr. Hassan Elhais explains how marriages are recognized in the UAE and how divorces are executed under the UAE Laws. 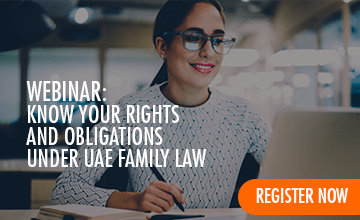 There are a number of exceptions, but in general, the Courts of First Instance (the lowest tier of court) have jurisdiction over family cases filed against citizens or foreigners who are domiciled or resident in the UAE. Family article on husband and wife rights under Shariah Law. There are specific rights designated to Husband and Wife under Shariah Law.